A section of Arsenal fans have called on Arsene Wenger to drop Mesut Ozil from the squad that will play in their next game. The Gunners will make a trip to Germany to face Bayern Munich in the first leg of the Champions League last 16 this week. 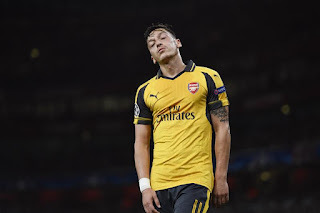 Ozil has been a subject of massive criticism for his poor performance in recent games. His gesture has brought a lot of worry to fans who are tired of their side's trophy drought. Many of them believe he is being over pampered by the boss, thereby causing him to act in any way he wants during games. Ahead of Arsenal's clash with Bayern on Wednesday, the fans have taken to Twitter to demand for his temporary exclusion from the starting eleven. We should change the formation to 4-3-3 with Ozil on the bench and a Ox-Coq-Xhaka midfield. Ozil has to be dropped.